On Saturday Yvonne and I headed to Real Canadian Superstore in East Gwillimbury. I needed to pick up a few things and she wanted to check out the Joe Fresh department. Another bonus was I had a coupon for 5,000 free PC Points if we spent over $50. This coupon would assist in putting my PC Point balance over the coveted 20,000 points which means $20 in free groceries. CHACHING! 1. Scrubbing Bubbles refill container for the Scrubbing Bubbles Automatic Shower cleaner. 2. Replacement brush heads for my Philips Sonicare Toothbrush. The Real Canadian Superstore was sold out of the Scrubbing Bubbles Shower refill containers. However, they had lots of starter kits. In fact they had so many starter kits, there were cases of them on top of the shelving units ready to be pulled down in order to stock the shelves at least 2 times over. But the main question is, wouldn't you need to refill these shower kits eventually? As for the Philips Sonicare brush heads? Nope...Real Canadian Superstore doesn't even carry the toothbrush. Yvonne didn't find anything at Joe Fresh she liked. So we left the store. We walked south on Yonge Street to Wal-Mart. They were also out of Scrubbing Bubbles and out of my replacement toothbrush heads. The store, of course being a Saturday, was crawling with idiots who were love to wedge themselves into an aisle with their little Wal-Mart shopping carts and excommunicating themselves to their own little world of shopping. This just gets me aggravated as to how people have become so unpolite towards other shoppers who are just trying to get in, grab a few things and get out. So getting out of Wal-Mart with idiots blocking the aisles slowed us down a bit. We continued our trek south, skipping Canadian Tire, and headed to Zellers without much hope of finding what we had set out for. The Zellers store at Upper Canada Mall. Over the past year this store had been under extensive renovations in order to expand the store and modernize the look. The store's improvements have paid off! I quickly found the toothbrush heads and, skipping over a couple of aisles, I had two choices of scents to choose from in the automatic shower cleaner refills. To say the least I was really dissapointed with the Real Canadian Superstore and Wal-Mart stock people. They can't seem to keep proper amounts of product on the shelves. This is an absolute Pet Peeve of mine. Companies that sell products that require refills, like the automatic shower cleaner, and then fail to work with the retailers to ensure enough product is on the shelves for their customers. 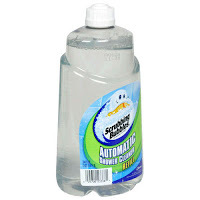 The automatic shower cleaner refill bottles I couldn't find at the Aurora No Frills, East Gwillumbury Real Canadian Superstore and the Newmarket Wal-Mart. If your going to market the product as refillable or have replacement parts, then sell the refills or parts! Otherwise sell the product as "DISPOSABLE!" because if you can't refill it/replace the part what good is it?